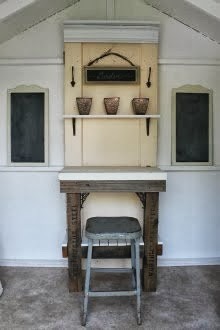 My Cottage Charm: How to paint a dresser ..Laundry Room Style! I promised you guys I would show you what I was going to do with the space under the cabinets in my laundry room. I’m going to show you, but don’t think I’m crazy OK? …don’t go screaming out of the room when I tell you about it…. Promise? Here it is in all it’s disastrous state…um, I mean glory! I took off all the hardware from the drawers and painted them black. I know….it sounds crazy, but stay with me here! I started sanding everything down….. I used my little palm sander and gave it all a good once over. I primed all the pieces with Kilz 2 primer…here’s the top with one coat. It took a LOT of priming! 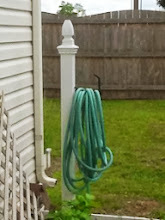 I painted the top with the same paint as the laundry room walls….a pretty pale aqua. *sigh*…I love that color. OK…are you ready to see it all finished and in place?!! Look at that, God did know what he was talking about! I should know by now not to doubt God! I LOVE it! Oh, look the cabinets have doors now! 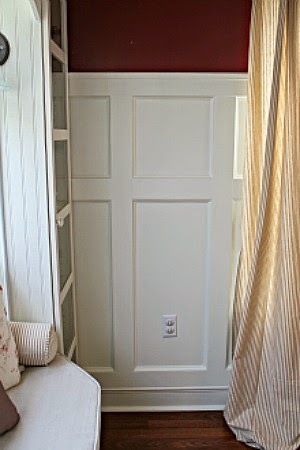 See the beadboard look in the doors I was talking about…it matches the dresser! OH, you remember how I told you I had plans for the top of the dresser where it was damaged? Well this is what I did…….. I went to Lowes and purchased a piece of plexi-glass and had them cut it down for me. I peeled off only ONE side of the plastic sheeting that comes on the plexi glass to keep it from getting scratched. I left one side on and placed it sheeting side down, it shows through as an opaque white. It totally solved the damaged top problem, is easy to clean and lets the pretty aqua trim show too. I LOVE it! Alrighty, I promised you one more project for today, so here it is…..see the little tin on the end of the dresser? I got it marked down at Michaels for next to nothing because the little metal handle was gone off the top…..but I had other plans! If you’ve never done vinyl before, it’s super easy. Just cut it out, peel away the extra like this…. Then cut out a square of contact paper to place over the top, remove the the paper back from the letter…. place it where you want it to go on your project. Once you have the letters where you want them, you just burnish them onto your project and peel off the contact paper from the top. There ya have it! See what I did to make a handle?! I just threaded some ribbon through the holes where the handle used to be……. Stay tuned to my next post where I’ll show you how I took care of that unsightly furnace and what I did to replace that horrible builders grade light fixture! Oh and a giveaway of an item I used in my laundry room is coming soon too! Tell me what you think of my dresser re-do! Oh Missy your dresser is so pretty! You did an awesome job! 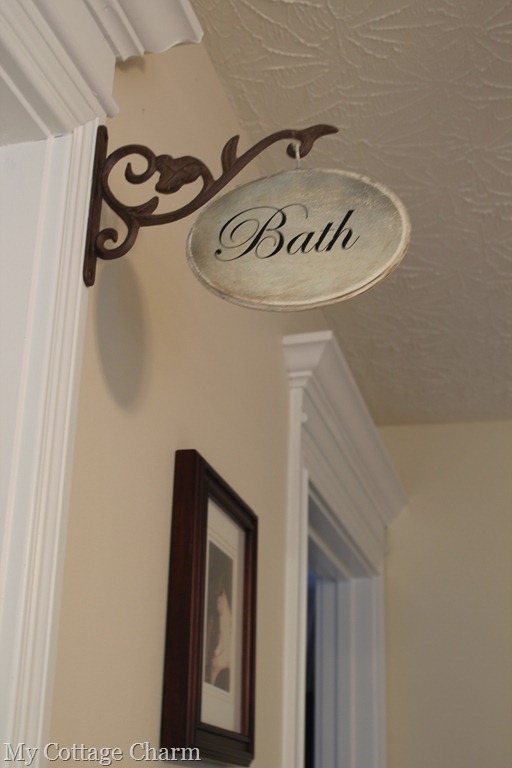 It is perfect for your laundry room!! That little box is just as cute as it can be! Perfect for your dryer sheets!! The dresser turned out great! Great idea for the plexiglass. Wish my laundry room looked like that. 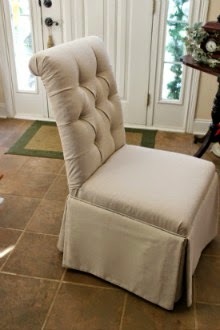 LOVE how your project turned out, everything about it! How cute it turned out and your lil tin u made is adorable!!! Well...all I can say is Wooooow Missy! 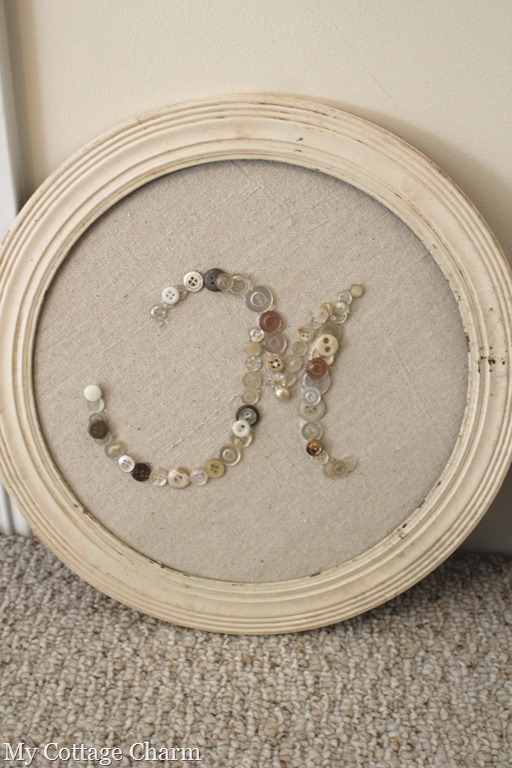 You turned that junky dresser into a gorgeous piece of furniture! And so functional too! Your laundry room is gorgeous!!! Beautiful! Love the mix of colors and all the drawers are such a smart idea for a laundry room. Great job - looking forward to seeing the rest! Oh my goodness, I love it Missy!!!! Wow, wow, wow! You have done a fantastic job, talk about making a silk purse out of a sows ear! I love your make overs! Missy!! Oh MY that is beautiful!! Truly was a blessing. 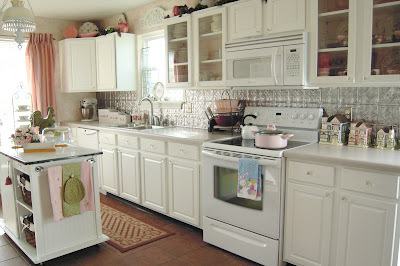 And goodness I need to catch up on my blog reading because your laundry room looks GORGEOUS!!! NICE. What an amazing transformation. Love what you did! It's perfect. He definately answered your prayers it looks so good in your room, it was meant to be. Great job. wow! this is incredible!! Great job!!!! Your laundry room is gorgeous. The dresser is perfect for storage and the little tin box is adorable. Can't wait to see how you disguise that furnace. I know it will be something totally unexpected and wonderful. This is fantastic! I have an antique dresser upstairs that I was thinking of putting out at our yard sale, but I think now I will re-purpose it into the folding table I keep telling Thomas I need. Can't believe the piece God led you too even had bead board trim work on it! Something you didn't mention about your beautiful new work space is all the extra storage you've just created for the room! What a great transformation. Love the colour of the dresser and the hardware. Is there anything you CAN'T do?? Great job on the dresser...it looks like it was literally made for that space! The whole makeover is just fantastic. Really great job I like it!! I will have to spruce up my laundry room. You put my laundry area to shame! Great work! So inspiring! That dresser could not be more perfect in that spot! I love the white, I love the black knobs, and I really love the aqua top. Do you mind telling me about the color and brand? I also love the metal box you made into a really cute fabric softener sheet container. Great job! WOW! Amazing what a little elbow grease can do! I'm glad you listened to God's voice - it's perfect! 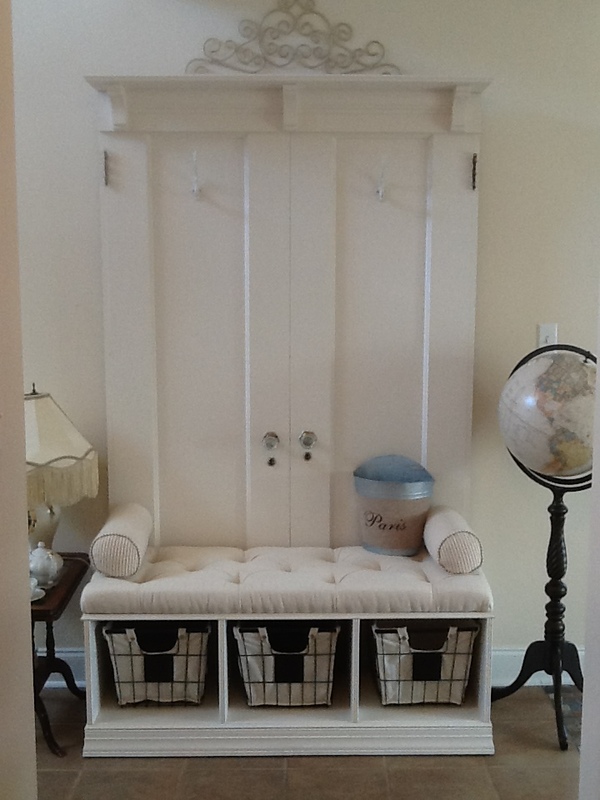 I now have laundry room envy! You should most definitely be proud of your hard work because it paid off! Looks fabulous Missy! Wow, that's amazing, great job! I LOVE your dresser!! It's amazing how a few coats of paint can give an old yucky dresser a new life!! Looks like it belongs in a magazine :)) Good job!! Wow! It turned out so great! Love the white and black combo! Found your link at Southern Hospitality and I'm following you now. This is incredible! I was just in my Goodwill and there was a beat up dresser that had a price tag of $60.00. I just couldn't bring myself to pay that much...$15.00 sounds much more reasonable! Your laundry room is just beautiful...I'm totally jealous! Wow you make me want to do a load of laundry :) I can never find a deal at GW, great job! WOW! WOW! WOW! It looks soooo Nice! I love your laundry room. You were such a good steward of what the Lord gave you:) Good job and thanks for sharing. I am your newest follower Hope you can visit me sometime soon. LOVE all of this!! 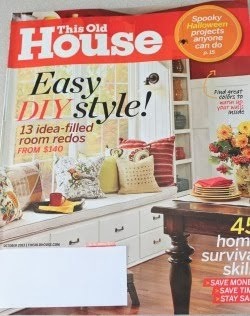 I am starting a laundry room redo and searched for ideas--your page is bookmarked now!! Well, you have truly inspired me to complete the 5 pieces of furniture being stored in my garage to repair and recreate. God was helping you the entire time and now He's going to help me through your inspiration. I love all that you've done and I applaud your diligence and creativity. Bravo to you. So happy that I signed up on your blog. You go girl.